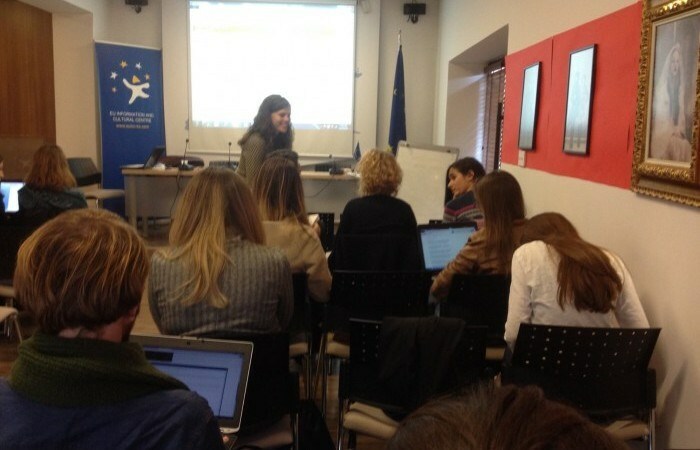 “Digital Storytelling: How to Blog”, training was unveiled last week by IPKO Foundation and Kosovo 2.0, in the E.U Information and Cultural Center, Prishtine. Roughly 20 participants from different backgrounds for one day learned the techniques, insights and everything related to online writing. This workshop gathered young people who have writing skills and love to keep a personal online diary, and need more knowledge to turn their articles in something professional to be published in the main Kosovarian platforms. During the sessions they weren’t only focused into writing, but covered some easy-to-use apps and online tools such as timelines, photographs and design platforms. Besa and Cristine, shared useful tricks, helped the participants to find interesting topics and provided technical methodology how to create a professional Blog, as one of the activists of content writing in the monthly magazine Kosovo 2.0. The best Blogs coming up from this creative group will be published in Kosovo 2.0 platform, while other participants will elevate their online presence and will be unique independent Bloggers. Blogging isn’t just typing words on a screen, but is about sharing something real with the audience!